Mrs.Trivedi:You are smiling like that after a long time.May I know the reason? Mr.Trivedi:Was thinking about our Anika. Mrs.Trivedi:I had an unknown fear that you two would not reconcile owing to respective stubborn nature but never stopped hoping.After all….Anyway,all’s well that ends well.I am really thankful to God. Mr.Trivedi:Shivaay has compelled me to change my mind Vasundhara.I was well aware of Anika’s condition and Shivaay’s involvement in it.Being a father,had to make some decision so I did.But I must appreciate Shivaay for his efforts.Rather the more I will say,will be less regarding this matter.I am indebted to him for life time.He has taken,still taking such good care of our Anika. Mrs.Trivedi smiles-God will bless Shivaay dear always.He is a pure soul. Mr.Trivedi:If it’s not for Shivaay then I don’t know what all could happen to my daughter.Though I said nothing but worried to death for her.He sighs. Mrs.Trivedi:I know everything.Pausing for few seconds-Can we go and meet her?I am dying to meet my Anika. Mr.Trivedi:Me too.For that,you have to wait Vasundhara.There is a surprise for Anika and that includes you too. Mr.Trivedi:Have patience.You and everyone will get to know soon. Mrs.Trivedi:Don’t know what you are planning. Mr.Trivedi says nothing just smirks. Gauri takes a deep breath holding the handle of the door.Then pushing it inward she enters. A painting exhibition is going on.So many people are strolling,taking notes,clicking photos,talking etc.As she walks ahead a girl greets her and gives her a welcome drink.Taking that Gauri looks around. Various paintings of different artists are being put for display.Exclusive in colour,exquisite in forms.Totally breath-taking view. But her eyes are looking for something else other than painting. Her gaze stops coming a gathering in the corner of the big hall.Mr.Omkara Singh Oberoi is standing in the middle of the gathering,giving autographs.Later,organizers come to meet him.Gauri observes him closely as he speaks.Om’s hair is flying slightly.Deep smile flashing on his handsome face.His strong body language is exuding power,naturally. Om:Thank you so much for coming,accepting my invitation Gauri. Om:I just thanked you for coming here. Om:So,how are you finding all these piece?Want to pass any compliments? Gauri:I,I mean very beautiful.They are so lovely.Did not know that you are an artist.It was a shocking and pleasant surprise for me,really.Your paintings must be here too.Can I see them? Om:Your work has finished here? Gauri:Yes,my university project is complete.I am leaving tomorrow. Organizer:Mr.Oberoi,plz come with me.Someone wants to meet you. Organizer:Mr.Oberoi,meet Mr.Rohan Sharma.He is one of the sponsors of our event.They shake hands. Rohan:It’s my pleasure meeting you Mr.Oberoi.I am a big admirer of your creation.In fact I have managed to stock few of your exclusive creations.Have wanted to meet you since long. Om:Pleasure to meet you too Mr.Sharma. Rohan:I have seen every single piece of painting of this exhibition.Every single one is beautiful and authentic.But one painting grabbed my attention differently. When I inquired about it got to know that you were its creator.I loved that specific painting very,very much.I want to take it with me. Om:You appreciate art and encourage such events and that’s highly commendable.Okay then,which one? Rohan points at a painting which has placed at the other corner.Smiling Om turns but his smile vanishes as he takes a look of it.Gauri too turns and gets shocked but few seconds later. Rohan:This painting is reflecting sheer beauty.Your taste,choice of theme,colour combination-everything got wonderfully balanced.One of your best works Mr.Oberoi. Om:I am really sorry Mr.Sharma but I don’t want to sell it. Om:I did not know that organizers had brought it here.You see,it’s a very personal piece and I have painted it for myself only.Not for the purpose of displaying or anything.I don’t want to exchange it for money I am sorry. Rohan:I have literally fallen in love with this painting Mr.Oberoi.You can name any price and I am ready to pay. Om:It’s priceless for me Mr.Sharma.I am really very sorry to disappoint you.But if you want then you can have any other of my collection but not this. Rohan:Looks like it’s very close to your heart and you have some special reason behind it to have it for yourself.Okay,I will take another one.Thank you so much Mr.Oberoi. Rohan leaves with the organizer.Om turns to Gauri.She is looking stunned. Om:Sorry for all these….Are you okay? Gauri:Why you refused such big offer? Om:I thought you heard everything.Do I need to repeat myself? At the background of sun-rising,a girl has stood looking at the horizon,on a valley.Om has painted Gauri watching sun-rise.That moment got explicitly portrayed with much feel and artistic touch,rendering it a life like stand…..Exhibition gets over.Om and Gauri leave for their respective addresses. Staff:Ma’am,this parcel just got delivered for you.Plz sign here. Staff:Don’t know Ma’am.Only your name is written and we got a call to make it reach to you. Gauri looks at her lost payal which has come through parcel.She is about to wear it but stops thinking something.Biting her lips she brings out a box and puts it inside. Next morning both Om and Gauri leave Jaipur,separately. Rudra has recovered finally.He has started his famous routine.In between played few pranks on Soumya,pestered Shivaay,did few venture with Anika. One week passed like one day with laughter,video calling,special recipe,learning and all. Precap:Shivaay is waiting for Anika to come out of the room,getting ready. 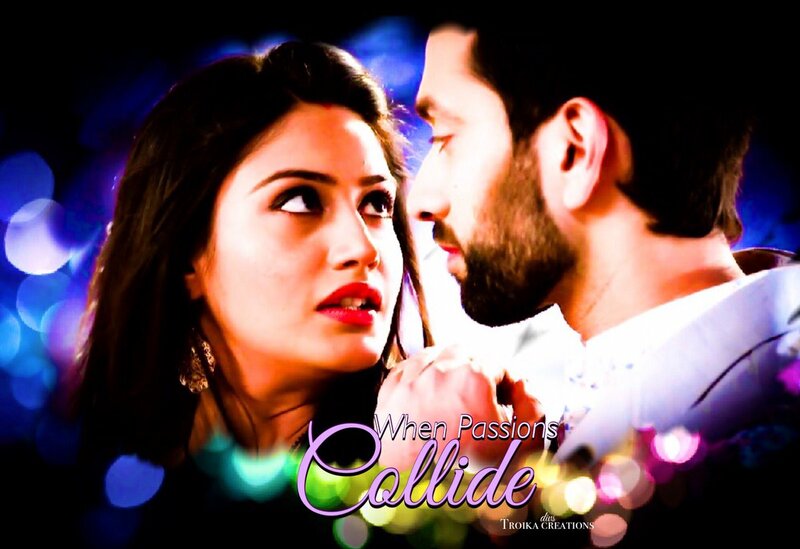 The post Chalte Chalte: A Journey Of Love (Shivika FF): Episode 49 appeared first on Telly Updates.